So you write him a letter and say "Her eyes are blue"
"Saw Phil Ochs this week with his new A&M record, and he took us over to a record player and spent fourteen cuts listening to it and before every cut he would say, “Well, dig the change of pace here.” Well, these next two songs are pretty much in the same pace as my first one and I know since Revolver that that isn’t very hip, but they’re all very different and this is a song about a child who was born under a certain sign. Signs are very strange lately too, you know, I was in Ottawa, and I met some people at a party and I was dressed up in one of my favourite costumes which is sort of a gold good fairy costume, consists of gold shoes and gold stockings and a gold dress, and all sort of burnished in gold and I was playing a gold country gentleman electric guitar in a corner, and a girl came in, and a fellow came in and several people sat around and I was told that I was giving them good vibrations, and then they said to me, “Well, what sign are you?” and I said, I told them what sign I was, and they all left the room. So the next day I saw the girl who was sort of the high priestess of the whole cult there, and she said, “Listen, you know, like, I just have to do a reading on you,” so she did a reading on me and found out that I had moon in Pisces which saved me and they all liked me again. This is about a child who was born with the moon in Cancer, and I hope that’s good." this song makes me want to cry every time I listen to it. 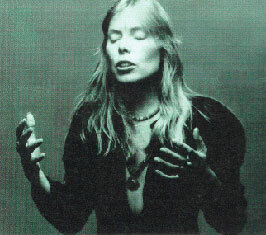 I think a big part of the greatnes in Joni is that she can make you identify with situations you've never been in, and feel like you're living them.